The 2012 focus country is Kenya. Kenya is known for its sparkling coffees with complex floral notes and bright acidity. During Nordic Barista Cup you will learn more about Kenya and it’s coffees and you will cup Kenyan coffees as well. 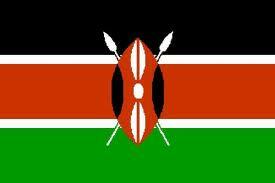 The Kenyan flag officially became the national flag in 1963. The black color symbolizes the black majority, the red symbolizes the blood shed in the fight for freedom and the green is for the land. At a later point the white stripes were added for peace. The traditional masai shield symbolized the defense of the things mentioned above. The 2012 NBC fileld trip to Kenya will be from 10th – 17th of November 2012. As always at NBC the winning team wins a trip to the focus country. We call it the NBC field trip. Anyone can sign up and travel with us on this week-long trip. The cost for one week round trip in Kenya is 1000€ (incl accomodation, meals, transport in Kenya). We will have Kenyan coffee experts hosting lectures in Copenhagen. The 2012 program will follow the chain from terroir and farming – to picking and porcessing – to market, auctions and exporting – to buyer-farmer relationships and technologies. Peter Kimata is an agronomist working for Central Kenya Coffee Mills, which serves over 200.000 farmers. He will talk about the “Agronomy of Kenyan Coffee” and host a educational cupping showing the different varieties and processings in Kenya. Further more Loise Njeru, managing director of Coffee Board of Kenya will talk about “Trade of Kenyan Coffee”. The money we collect at NBC this year will go to improvement of the Karinga Primary School in Kiambu County, Kenya. The school serves coffee farmers of Karinga, Muiru and Karatu wet mills associated with Gitwe FCS. You can read more about THE 2012 DEVELOPMENT PROJECT HERE.